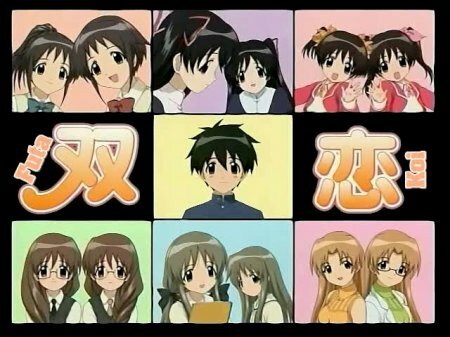 From top left: the childhood friends; the rich girls; the lolis; the lead; the shy meganekko; the tsundere and the sick girl; the older women. When Futami Nozomu returns to his childhood hometown in order to attend high school, he is delighted to be reunited with his friends, the Ichijou twins. There is clearly a hint of romance in the air, but if Nozomu thought that choosing which of the twins he should go out with was difficult, he gets something of a rude awakening when he finds out that town is literally filled with many sets of twins- each of them interested in pursuing his heart! Who will Nozomu end up with, and how will the others react if he ever does make a choice? Harem series are hardly uncommon in anime, and at first glance Futakoi seems to be just another example of the genre, with the somewhat obvious gimmick that all the girls just happen to be sets of identical twins. Admittedly, this can hardly be said to be the world’s most original and groundbreaking series, but nor is it as poor as prospective viewers might fear- in fact, Futakoi is a perfect example of light entertainment done right. From summer vacation to shopping trips, everything in Futakoi has been done before, but somehow the series approaches its material with such a sweet simplicity that you cannot help but enjoy it. Where the likes of YoakeNa became increasing dull and uninspiring after the first few episodes, Futakoi somehow maintains viewers’ interest throughout its entire run. Part of Futakoi’s strength lies with its cast- like the story, they are all fairly standard, but the way they are handled makes them entertaining nonetheless. Having whetted the curiosity by introducing all the twins in the OP sequence, Futakoi divides its cast into two groups; those who are introduced and developed from the start, and those who are introduced for an episode or two later on. In this way, the series avoids the usual “too many characters for too few episodes” curse of the thirteen episode series, by making it clear from the outset that the bulk of the spotlight will fall on the leads, whilst the others are just supporting acts included for a little variety. Of equal importance is the fact that Nozomu is not quite the standard harem lead- he may be an ordinary boy with an inexplicable attractiveness to girls, but at least he isn’t whiny and irritating along with it. Visually, Futakoi uses a simple and bright style which perfectly complements the light atmosphere of the series. The OP is slightly catchy, but in general the music is forgettable. Although it is not destined to win acclaim for being particularly outstanding in any one area, Futakoi is nonetheless a good example of how straightforward light entertainment should be made. If you just want a simple diversion, look no further than this series. This entry was posted in Series reviews and tagged light entertainment. Bookmark the permalink. Now you’ll have to watch Futakoi Alternative. It’s made of giant squid and win. I actually watched both Futakoi and Alternative a while back, it’s just that I hadn’t got around to reviewing either of them until now (will post an FA review soonish).